dougettinger wrote: Are "minor" and "dwarf" planet considered interchangeable for Pluto and Ceres ? Is Doug still out there in the blogosphere, or did he give out since his questions weren't being answered? Anyway, as modifiers of the noun "planet" the words "minor" and "dwarf" are not interchangeable. I'll be corrected if I'm wrong (and maybe even if I'm not wrong ) but dwarf planets are the smallest objects that actually are planets by virtue of the fact that their mass is large enough to have pulled themselves into a round shape. Minor "planets" aren't planets, at least in many (most?) people's (persons?) opinions. Minor planets refer to all the irregularly shaped leftover (natural) junk that's orbiting the Sun. I personally don't like the term minor or dwarf planets! If we need to use the term dwarf planet to be politicaly correct; than we should use the term giant in the same way when referring to the solar system! Lets see; that gives us 4 planets 4 giant planets and a half a dozen of so dwarfs! My gosh; isn't life complicated enough as it is? The junk as in the asteroid belts; I grew up calling them asteroids of planetoids! I never really heard the term minor, but I guess it is just as good as dwarf! I know; dwarf is officially the correct term for Pluto; Ceres; and a few others! I don't think Vesta quite makes the grade; or does it? 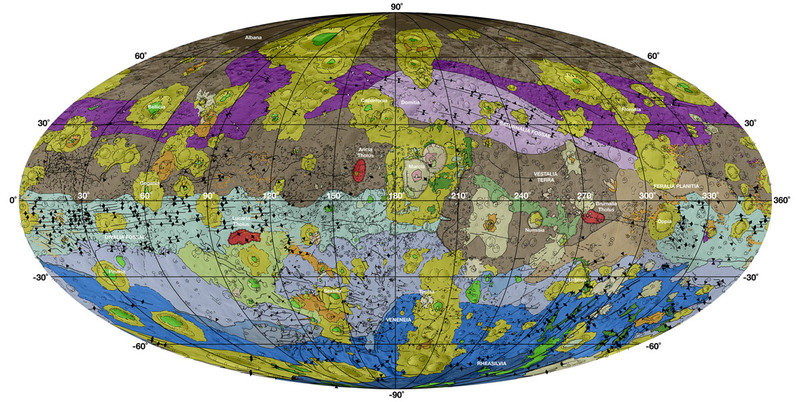 Images from NASA's Dawn Mission have been used to create a series of high-resolution geological maps of the large asteroid Vesta, revealing the variety of surface features in unprecedented detail. These maps are included with a series of 11 scientific papers published this week in a special issue of the journal Icarus. The Dawn spacecraft has delivered a glimpse of Ceres, the largest body in the main asteroid belt, in a new image taken 740,000 miles (1.2 million kilometers) from the dwarf planet. This is Dawn's best image yet of Ceres as the spacecraft makes its way toward this unexplored world. "Now, finally, we have a spacecraft on the verge of unveiling this mysterious, alien world. Soon it will reveal myriad secrets Ceres has held since the dawn of the solar system," said Marc Rayman, of NASA's Jet Propulsion Laboratory in Pasadena, California, chief engineer and mission director of the Dawn mission. Dawn will be captured into Ceres' orbit in March, marking the first visit to a dwarf planet by a spacecraft. To date, the best images of Ceres come from the Hubble Space Telescope. In early 2015, however, Dawn will begin delivering images at much higher resolution. Since launching in 2007, Dawn has already visited Vesta, a giant protoplanet currently located 104 million miles (168 million kilometers) away from Ceres. The distance between Vesta and Ceres is greater than the distance between the Earth and the sun. During its 14 months in orbit around Vesta, the spacecraft delivered unprecedented scientific insights, including images of its cratered surface and important clues about its geological history. Vesta and Ceres are the two most massive bodies in the main asteroid belt. The nine-pixel-wide image of Ceres released today serves as a final calibration of the science camera that is necessary before Dawn gets to Ceres. The dwarf planet appears approximately as bright as Venus sometimes appears from Earth. Ceres has an average diameter of about 590 miles (950 kilometers). 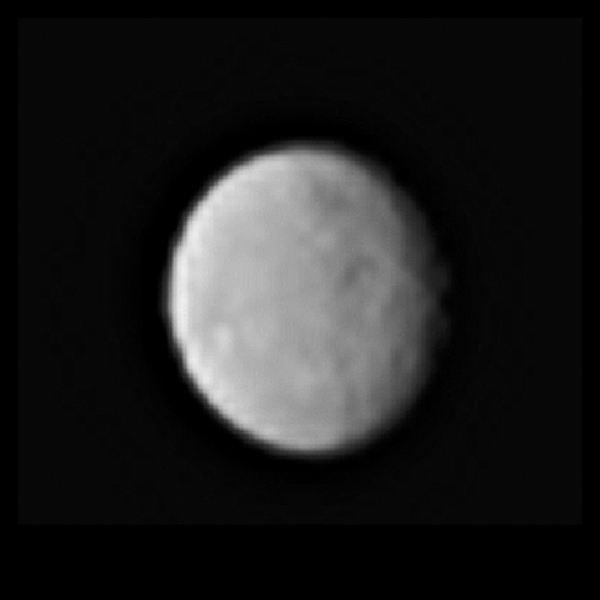 Dawn begins its approach phase toward Ceres on December 26. NASA's Dawn spacecraft has entered an approach phase in which it will continue to close in on Ceres, a Texas-sized dwarf planet never before visited by a spacecraft. 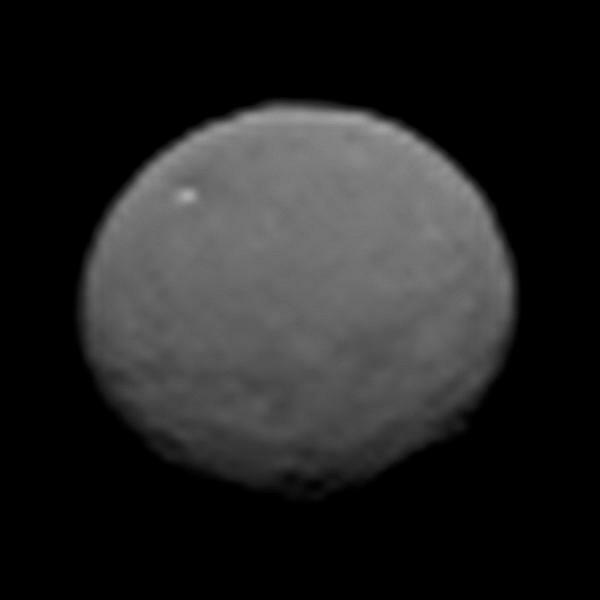 Dawn launched in 2007 and is scheduled to enter Ceres orbit in March 2015. Dawn recently emerged from solar conjunction, in which the spacecraft is on the opposite side of the sun, limiting communication with antennas on Earth. Now that Dawn can reliably communicate with Earth again, mission controllers have programmed the maneuvers necessary for the next stage of the rendezvous, which they label the Ceres approach phase. Dawn is currently 400,000 miles (640,000 kilometers) from Ceres, approaching it at around 450 miles per hour (725 kilometers per hour). The spacecraft's arrival at Ceres will mark the first time that a spacecraft has ever orbited two solar system targets. Dawn previously explored the protoplanet Vesta for 14 months, from 2011 to 2012, capturing detailed images and data about that body. 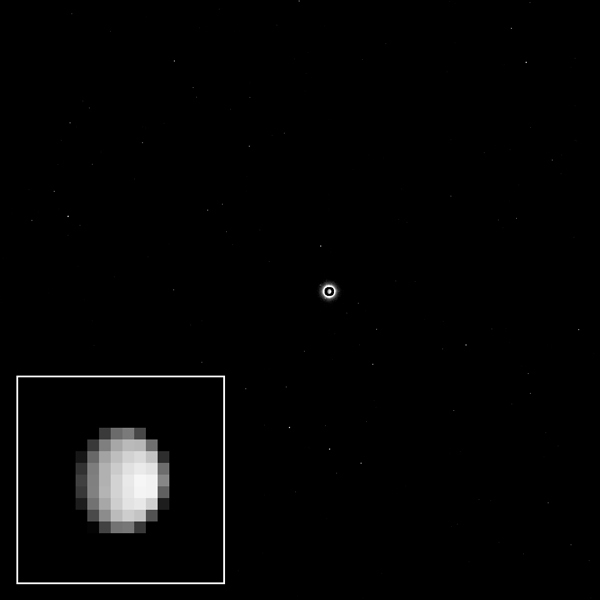 As NASA's Dawn spacecraft closes in on Ceres, new images show the dwarf planet at 27 pixels across, about three times better than the calibration images taken in early December. These are the first in a series of images that will be taken for navigation purposes during the approach to Ceres. Ceres is the largest body in the main asteroid belt, which lies between Mars and Jupiter. It has an average diameter of 590 miles (950 kilometers), and is thought to contain a large amount of ice. Some scientists think it's possible that the surface conceals an ocean. At 43 pixels wide, the new images are more than 30 percent higher in resolution than those taken by NASA's Hubble Space Telescope in 2003 and 2004 at a distance of over 150 million miles (about 241 million kilometers). The resolution is higher because Dawn is traveling through the solar system to Ceres, while Hubble remains fixed in Earth orbit. The new Dawn images come on the heels of initial navigation images taken Jan. 13 that reveal a white spot on the dwarf planet and the suggestion of craters. Hubble images also had glimpsed a white spot on the dwarf planet, but its nature is still unknown. "Ceres is a 'planet' that you've probably never heard of," said Robert Mase, Dawn project manager at NASA's Jet Propulsion Laboratory in Pasadena, California. "We're excited to learn all about it with Dawn and share our discoveries with the world." The Dawn mission released new images of Ceres yesterday, taken on February 4, when Dawn had approached to within 145,000 kilometers. I would like to pause for a moment here to express my thanks and appreciation to the Dawn Framing Camera team for being so forthcoming with these images, to allow the whole rest of the world to look over their collective shoulders and allow us to gaze with them, for the first time, onto a huge, previously unexplored world. That didn't happen at Vesta; I'm so, so glad it's happening at Ceres. Craters and mysterious bright spots are beginning to pop out in the latest images of Ceres from NASA's Dawn spacecraft. These images, taken Feb. 12 at a distance of 52,000 miles (83,000 kilometers) from the dwarf planet, pose intriguing questions for the science team to explore as the spacecraft nears its destination. "As we slowly approach the stage, our eyes transfixed on Ceres and her planetary dance, we find she has beguiled us but left us none the wiser," said Chris Russell, principal investigator of the Dawn mission, based at UCLA. "We expected to be surprised; we did not expect to be this puzzled." NASA's Dawn spacecraft has returned new images captured on approach to its historic orbit insertion at the dwarf planet Ceres. Dawn will be the first mission to successfully visit a dwarf planet when it enters orbit around Ceres on Friday, March 6. "Dawn is about to make history," said Robert Mase, project manager for the Dawn mission at NASA's Jet Propulsion Laboratory in Pasadena, California. "Our team is ready and eager to find out what Ceres has in store for us." Recent images show numerous craters and unusual bright spots that scientists believe tell how Ceres, the first object discovered in our solar system's asteroid belt, formed and whether its surface is changing. As the spacecraft spirals into closer and closer orbits around the dwarf planet, researchers will be looking for signs that these strange features are changing, which would suggest current geological activity. "Studying Ceres allows us to do historical research in space, opening a window into the earliest chapter in the history of our solar system," said Jim Green, director of NASA's Planetary Science Division at the agency's Headquarters in Washington. "Data returned from Dawn could contribute significant breakthroughs in our understanding of how the solar system formed." Dawn began its final approach phase toward Ceres in December. The spacecraft has taken several optical navigation images and made two rotation characterizations, allowing Ceres to be observed through its full nine-hour rotation. Since Jan. 25, Dawn has been delivering the highest-resolution images of Ceres ever captured, and they will continue to improve in quality as the spacecraft approaches. Sicilian astronomer Father Giuseppe Piazzi spotted Ceres in 1801. As more such objects were found in the same region, they became known as asteroids, or minor planets. Ceres was initially classified as a planet and later called an asteroid. In recognition of its planet-like qualities, Ceres was designated a dwarf planet in 2006, along with Pluto and Eris. Me too. I also just discovered I've been mispronouncing Ceres and Enceladus, at least according to the two people in the video. It makes me wonder how many other names I don't know how to pronounce. Nitpicker wrote: Me too. I also just discovered I've been mispronouncing Ceres and Enceladus, at least according to the two people in the video. It makes me wonder how many other names I don't know how to pronounce. Check the list of stars and their phonetic pronunciations if you want a good dose of that. Sometimes there's mixed agreement on how to pronounce things, even. Astronomers all seem to say Carina like Kah-reen-uh and doctors I know say it like Kah-rine-uh. geckzilla wrote: Sometimes there's mixed agreement on how to pronounce things, even. Astronomers all seem to say Carina like Kah-reen-uh and doctors I know say it like Kah-rine-uh. It looks like both are OK, with the doctors in the lead, i.e. Kah-rine-uh is the preferred official pronunciation. What if the dwarves are hostile? Emailed Bob; Got a new title! I'm not understanding why pictures were available all the way up until Dawn was close enough to see the rock up close, in orbit. Now that its close enough to see what the bright spots are................We have to wait???? THX1138 wrote: I'm not understanding why pictures were available all the way up until Dawn was close enough to see the rock up close, in orbit. Now that its close enough to see what the bright spots are................We have to wait???? From what I understand, though it's in orbit it has to do some maneuvering and is actually farther from Ceres now than it was when it was approaching. Recall how Rosetta was doing triangles around 67P when it first arrived. Well, it's in a sort of calibration phase of operation right now, after entering polar orbit. They're imaging, but I'm not sure how those images are actually being used. I don't think the primary goal is science until they drop into a lower orbit next week. The relative speed is constantly decreasing but not the distance. from 41,500 miles and only of the dark side of Ceres. Is that a response to my comment? The mission plan for Ceres requires a couple of weeks in a high polar orbit calibration phase (which I think has just begun) followed by a full body imaging program from a much lower orbit, coming up in a week or two. Now that [Dawn] close enough to see what the bright spots are................We have to wait???? Just listened to the press conference Rob linked to and the real reason they kept giving for the delay in new photos coming out is that Dawn is now orbiting on the "dark side" of Ceres. The higher the orbit and the lower the mass of the body being orbited, the slower the orbit. Dawn will be over the sunlit side of Ceres in April. Correction: the press conference I referred to was the JPL link provided by bystander. Apologies. Last edited by BDanielMayfield on Sun Mar 08, 2015 3:43 pm, edited 1 time in total. The really good, close pictures will come at the end of the year. In the meantime, we'll have New Horizons to fly by Pluto to make up for the wait.